Every community that has been historically disadvantaged needs an advocate. These communities need someone who works tirelessly to put their issues on the most important agendas. They need someone who celebrates their achievements, with the knowledge that their advancement is against great odds. For decades, people of African descent in Arlington, Virginia have had just this kind of advocate in Dr. Margaret Wilson. In particular, the students of African descent in Arlington Public Schools have been the recipients of her vision, leadership and activism. Dr. Wilson is a native Pennsylvanian and graduate of the University of Pittsburgh. She also earned a masters and doctorate in clinical psychology from Case Western Reserve University in Cleveland, Ohio. 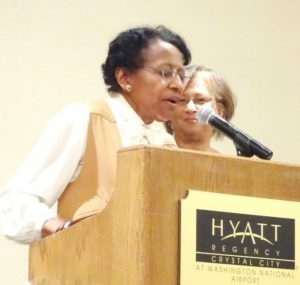 She recalls that her involvement in the life of Arlington’s Black students began because there was no Black representative on the school board when she first moved to Northern Virginia some forty plus years ago. Therefore, she sprang into action, to put together a community group that could provide oversight of the school board, on behalf of minority students. She is the founder of the Civic Coalition for Minority Affairs, which is a countywide, advocacy organization for the minority community. Shortly after her arrival in Arlington, she also became Chair of the Education Committee of the Arlington Branch of the NAACP. She held that position for four years and became a member of the Advisory Council of the Northern Virginia Urban League in 1983. Her lifelong civic engagement is in addition to a long career. Dr. Wilson was a practicing clinical psychologist for most of her career. She is a member of the American Psychological Association and formerly a fellow in the American Orthopsychiatric Association. Yet it was her time as a French teacher that ignited in her a passion for education that shines through to this day. She is both a source of history on multicultural issues in Arlington and a visionary on how to uplift minority students. Offering some advice on activism for today’s leaders and future leaders she said that you have to find something that you are not satisfied with and be willing to extend yourself and speak up for what you believe in. To spend time with Dr. Wilson is to be keenly aware that you are in the presence of significant history and hard-won wisdom. To watch her award students of African descent for stand-out academic performance is to witness her lift a community one member at a time. Would that every community have a Dr. Margaret Wilson, but for now Arlington is grateful, that she calls this place home.